So for whatever reason, some kind of madness has overtaken me, and I started writing a d20 system for Pillars of Eternity. I've already downscaled the numbers to be easier to work with in a pen and paper tabletop, made an Action Point economy to replace the realtime action speed adjustments in the computer game, worked out weapons and armor, and modified the benefits from attributes....so suffice to say, I'm on a roll. This system is intended not to be a 100% faithful translation of PoE to tabletop, but rather a simplification that can be played relatively easily at a low-tech pen and paper tabletop game, while still capturing the general feel of PoE. I've literally been working on this all night, and am very tired right now, so I apologize if this isn't wholly coherent. But college is requiring me to put this down for a day or two, and I want to see if there's any interest in the meantime. Other features of the final system document will include rules for noncombat exploration, rules for creating unique weapons, a bunch of setting reference stuff, and, uh, homebrewed Godlike varieties. So, is it a 4E clone? Nah. "Bloat" and "MMO" aren't the objectives here. 13th Age is a perfectly serviceable 4E clone without feeling bloated or MMO-esque. And frankly, I'd rather prefer 4E's "soulless", uniform approach over the convoluted, unbalanced mess that was 3.x. Noted. Don't worry, I'm trying to balance it, too. I expect the system will go through some revisions as people find things that are overpowered, underpowered, or otherwise broken. Basically, I'm aiming for fun, accessibility, and feeling like PoE. And things aren't fun if they're unbalanced. I'll post sections on GoogleDocs or something as they're completed, so folks can critique. Hey folks! I'm out of the metaphorical frying pan of college for the weekend, and back to working on the system writeup. Click HERE to read the Google Doc. I've got a super-short Introduction and a draft of the Races. You'll probably notice the racial perks for Godlike look...different. Basically: the numbers you have to crunch are smaller than the numbers the PoE computer game crunches, there's an Action Point system since you can't exactly run tabletop rpgs in realtime easily, and they've all been rebalanced to be simpler while still maintaining the general flavor and feel of those abilities. Comments and critique are encouraged! Okay, it's not letting me edit my original post, but I just want to let people know I have a PDF of the Characters section ready to go! Here's the PDF for your reading pleasure. EDIT: I...just realized I forgot the charts for attributes. I'll insert those in the next WIP post. Edited by globalCooldown, 29 February 2016 - 12:55 PM. It's time for your weekly PoE homebrew update! Version 0.0.2 has those charts I forgot last time, as well as a Rules section! Now you can read about fun stuff like action points, challenges, starvation, and more! I'm interested, I'd look to try this out if I ever get time to DM for my current group. Are you making the combat / AP / etc systems with any kind of playtesting or just mockign it up for now? Once I get enough of it written out, I certainly am looking to run some playtests! In fact, since I'm graduating from college in May, and most of my real-life friends have already moved on, I'll probably be holding most of my playtesting online. I'm thinking...roll20? I know that you were probably following the classic D&D table of contents, but to be honest I think it would have been better, at least for these early drafts, to put the action resolution mechanics on the forefront. Most of the stats/fluff seems to mirror what was already in the game anyway, but this is a tabletop RPG, not a videogame, and I want to know what kind of campaign it will handle and how it will handle them. That's all I can say for now because I've only skimmed through the documents, I will try to give some more detailed feedback soon. Edited by WorstUsernameEver, 11 March 2016 - 01:15 AM. I think it would have been better, at least for these early drafts, to put the action resolution mechanics on the forefront. You're...probably right. I'm very close to posting my next draft; I'll take a moment to rearrange the content before I do so. Click HERE for the 0.0.3 PDF. Yes, the formatting for Weapons is utter garbage. That's the first thing I'm going to update for the next PDF. Attributes now have tables. May reorient them for easier reading for the next version. Brief summaries of paladin orders and priest deities have been added to their class sections. More rules! The Rules section has also been placed in front, instead of the Character section. Actually, a note about rolling up characters...I'd like to reach out to you folks here on the forums, and see what you do with character creation! Roll up the character YOU want to play. Seeing a bunch of different character sheets for different classes will help me better scale things like abilities, talents, item effects, enemies, level-up bonuses...basically, the whole system. So make your characters, and show them to me! I'm not particularly experienced with tabletop gaming, but this is something I'm very interested in and will be keeping a close eye on. It might be an idea to include a blank character sheet, or a spreadsheet version with derived stats included. But yeah, this looks very interesting and I'll definitely be rolling up a character when I find the time. For document preparation, formatting, and typesetting, can I suggest LaTeX? There's a slight learning curve (although it's probably nothing too insurmountable for anyone who's enough of a nerd to write their own homebrew RPG rules ), but the results are truly beautiful. Edited by hamskii, 13 March 2016 - 09:34 AM. As for LaTeX: I am actually...semi-familiar with it. I used it for a discrete mathematics course once. I'll probably be switching over once I have things actually written out. Hey folks! No PDF update this week; I've mostly been focusing on writing the sample adventure for this system. Yeah, I'm making one of those. Let me tell you about it! Headwater Hold is a dungeon crawl designed for low-level characters. The eponymous Headwater Hold is a ruin of an Aedyran keep that was never finished before the War of Defiance, when Dyrwoodan forces and their Glanfathan allies sacked it. The ruin gets its name from its close proximity to the headwaters of one stream, which winds south and joins a larger river near Cold Morn. Further to the northwest is the town of Coppercwm, which sprang up only a few years ago around a rich copper vein at the foot of the nearby mountains. But when the skuldr from Headwater Hold start moving to the copper mines in great numbers, who will help the town? And who's only in it to investigate rumors of a member of the Dozens' Expedition Hall hiding in the Hold with an Engwithan relic? Like in the PoE computer game, experience will be given for completing objectives and advancing the story, not killing monsters. But don't worry; there will be plenty of story! Fix the weapons section and its abuse of lists. A section on experience points. And maybe, just maybe, more on Deities and Factions. Names removed just to be on the safe side, but that's definitely a "go ahead with your silly fan thing" from Obsidian! In the coming week, expect some more stuff in the Items section, including better formatting, prices, miscellaneous items, and, college permitting, traps and monsters. We're going to have our first Playtest. The playtest will be held online, on roll20.net on Sunday, April 3, at 2:00pm EST (that's 18:00 GMT for those of you across the pond). This playtest is going to be a combat-heavy little affair, where I test out low-level monsters on a level 1 party. Your comments on 4e are kind of annoying. 4e doesn't play like an MMO and PoE is the closest thing we have for a proper CRPG for 4e. That being said, thank you for making this. Hyped. I can't play in the playtest, but I actually love this idea, and if you need any help at all, I'm quite the fan of the game. I own the guidebook, as you can see I'm a backer, and...yeah. I love this kind of crap. I'd actually sort of been working on my own homebrew, but I like your stuff much better. I'm gonna pm you my skype if you're down for some PoE TTRPG talkin. An incomplete guide to level advancement! Next update will be defining ability gains per class, and filling in some abilities and talents. Several low-level enemies for you to take a crack at. 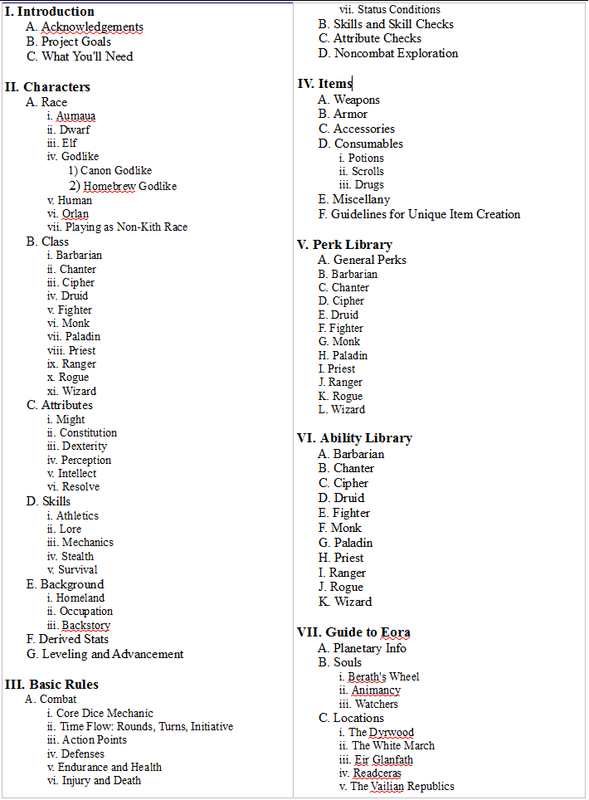 In the playtest last Sunday, I actually tried out about half of these, and they seem to be working well! Made the diagrams in the AoE section better. Optional rules for critical fails, cover, no maiming before death, and craaaaaawling in your skin one square per round when Downed. Edited by globalCooldown, 04 April 2016 - 11:11 PM.